Yesterday's post was about creating and using negative space. This must have been stuck in my mind. 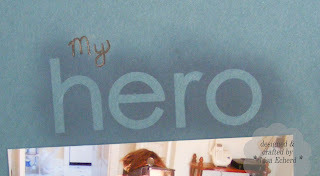 When I was finishing up this layout yesterday, I wanted a subtle title so once again turned to negative space. To create the title, I just adhered stickers and then sponged over the area with a slightly darker shade of ink than the background paper. After removing the stickers, a clear title shows through. It accentuates the 'quiet hero' concept of my husband taking care of everyone in his life with all the little things he does. Note: Don't write anything on your ink sponged area and then try to erase it as I did with my penciled in "My." The ink will come off with the eraser marks. Just had to leave them in place. 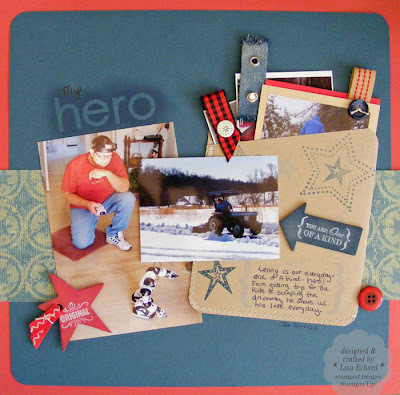 This layout started from a lovely design I saw in an old Creating Keepsakes magazine. The layout was of single baby photo beside a pocket containing several tags of journaling. The elements were on a plain cardstock backbground. After 4 weeks of creating layouts with 7 photos each, I figured our eyes would need a rest as we perused our album someday. So I created the layout using the pocket to hold the remaining 5 photos for the week. 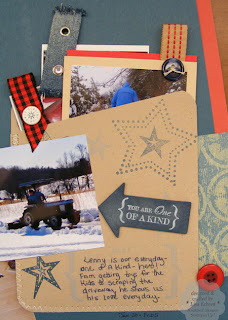 Try as I did, I just could not put all this on a solid cardstock background with no designer paper. I tried, I really, really did. But it was bare, boring, the elements were lost, I tell you, drifting on the page! So I just had to find a strip of DSP and add a border to bring it all together. Here's one of the tags inside the pocket. Lenny has been trying to teach our cat the word "Mine" - meaning, "My chair, you need to get up now." The bubble says, "Oh you deluded human. 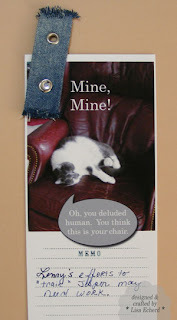 You think this is your chair." Clearly, there is a steep learning curve. DSP: Western Sky by SU! Embellishments: A variety of sources including one SU! ribbon and star chipboard from Oriental Trading.